Cake & Heels: Test Kitchen: 10/08/10 "As Seen on TV"
Test Kitchen: 10/08/10 "As Seen on TV"
So after the debacle that was my first Test Kitchen Shenanigan's, P & I were ready for round 2. And we couldn't have picked a better night, "As Seen on TV" with some of our Top Chef favorites, Alex Reznik, CJ Jacboson & Betty Fraser! Now I'm going to say right off the bat, that I forgot to grab the cocktails menu off the table when we were leaving, so I've already failed at commenting intelligently on my first set of photos. 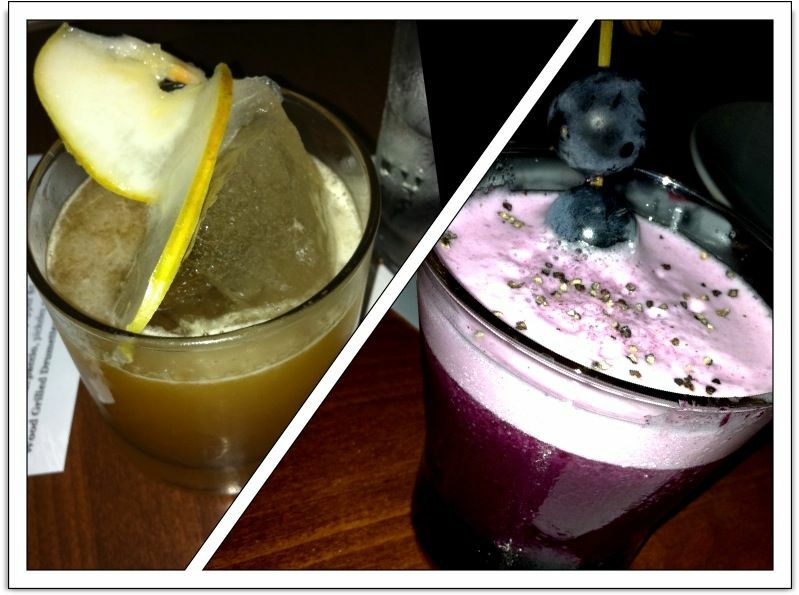 The first was a combination of pear & dark rum, and the second a wonderfully kiddie drink of muddled grapes with a black pepper garnish. Both were intoxicatingly perfect, and totally satiated my cocktail sweet-tooth. There wasn't very much to this dish & the flavors didn't really work all that well together. I had all of 2 pieces of octopus & the warm olive oil dressing ended up making my flatbread all soggy. I did like the tomato/arugula combo, but all in all it just felt a little messy. I've never had sturgeon before (aside from their babies on toast points, yum) but this first introduction was delicious. The fish felt a touch over-cooked, but the flavors were delicate and the rye crisp was perfect. The bowl however made it really hard to keep my rye crisp from falling into the consomme and getting soggy, but that was about my only complaint. "And topped with a star cutout won-ton" To which Punky replied, what is this won ton made out of? There was a lot going on in this dish and it all worked very well together. The best bite was comprised of a tiny bit of each ingredient, the smooth and cooling latke with the citrus-y swai, the vinegary slaw and the heat from the fire oil drops. Yum! So. They took a roasted pork and literally replaced the rib with scallops! How cool is that? I wish my picture could have done the dish justice, but the sweet/salt factor worked really well & the meat was incredibly tender. I know it's totally un-foodie of me to not like bone marrow, but I don't. I've tried, but the texture is just too weird for me to handle and the flavor reminds me of the dentist. The short rib & the tongue however were well flavored, the beet sauce just right, and the insanely hot pepper (which I could barely eat) a nice spice to the cooling crème fraiche. We tried to ask Alex later what kind of pepper he'd used, but got no real response. And finally on to the dessert! By far the BEST course of the evening, it had everything you could want. Salty, sweet, savory & rich. I could eat this at every meal! Unfortunately we didn't save space in our tummies for their Bar Snacks: Fried Pickled Porkbelly. Spicy Dip. I was really looking forward to this, but my body just couldn't say yes to more food. Also, this all makes me realize is that I really need a nice new camera. Maybe a Christmas present to myself... I'm thinking Olympus E-PL1. Anyone have any thoughts? 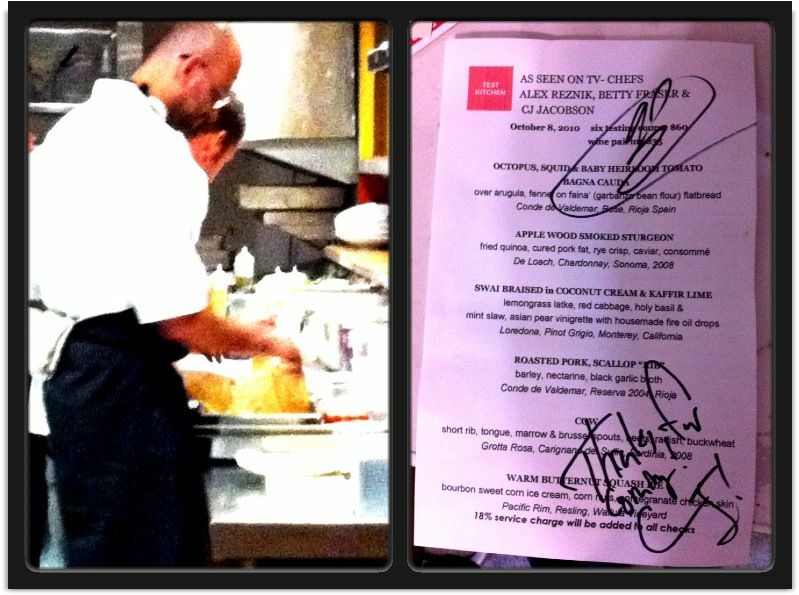 After our meal, the hostess treated us with a visit to the kitchen were we got to meet both Alex & CJ! It was a great way to end the evening & I'll certainly be back at least a few times before they pack up the Test Kitchen and leave town. Also super thanks to Stephane for kindly comping our meal after we'd missed out on Test Kitchen Claustro a few weeks earlier.